As per practice guidelines of the American Society of Anesthesiologists (ASA), chest X-rays are recommended in patients with a history of smoking, recent respiratory tract infection, chronic obstructive pulmonary disease, and heart disease. Health and Care Excellence guidelines also recommend that chest X-ray should not be done routinely in elective cases. A 41-year-old female, ASA physical status I was scheduled for surgery of fibroadenoma left breast. 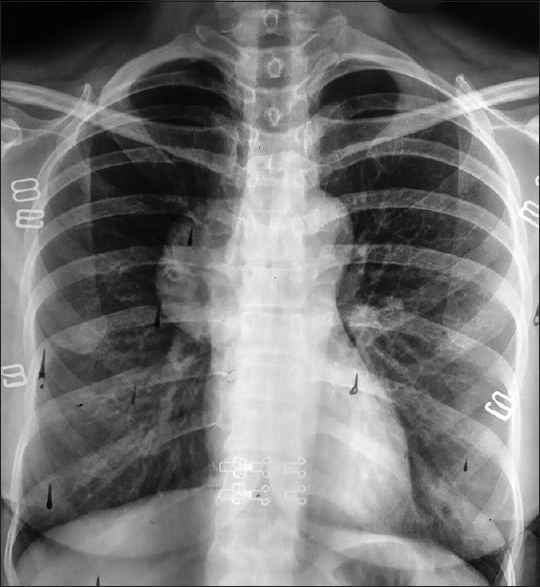 As a part of routine preoperative evaluation protocol, a chest X-ray was done which showed a large opacity obscuring the right hilum, suggestive of mediastinal widening with normal lung fields [Figure 1]. There were no symptoms suggestive of compression. The patient was referred back to surgeons for further evaluation. Computerized tomography (CT) chest reported a 5 cm × 3.5 cm mass with smooth lobular margins in anterior mediastinum closely abutting the ascending thoracic aorta, superior vena cava, and right atrium. CT-guided fine-needle aspiration cytology showed lymphoid cells admixed with occasional cluster of epithelial cells, suggestive of thymoma. A surgical plan of operating simultaneously for both thymoma and fibroadenoma breast was made. The patient underwent video-assisted thoracoscopic surgical removal of thymoma using one lung ventilation (35 Fr left-sided double-lumen tube), followed by excision of fibroadenoma. As per Masaoka staging system, the tumor was Grade I with good prognosis. The patient was extubated and postoperative course was uneventful. Routine preoperative screening of chest X-ray is not indicated according to international guidelines., Exposure to radiation, economic cost, and low incidence of clinically significant findings leading to change in anesthetic management are the reasons cited for this. In India, due to high prevalence of tuberculosis, chest X-ray is generally done by surgeons and anesthesiologists as part of preoperative screening. In the present case, chest X-ray revealed an incidental finding of a large thymoma which was totally asymptomatic. Almost 30%–50% of all patients with thymoma are asymptomatic and the mass is an incidental finding on chest X-ray or CT. If undetected, the tumor may increase in size and cause pressure symptoms such as superior vena cava syndrome, dysphagia, cough, chest pain, and myasthenia gravis. Once detected, thymomas must be removed surgically. Hence, incidental finding was a blessing in disguise for this middle-aged woman as the tumor was still in stage 1 with good prognosis. Therefore, it is suggested that a preoperative chest X-ray examination is a useful tool during preoperative evaluation, and the international guidelines should have a relook in the light of this finding, rather than be stringently enforced. No ethical issues involved and patient gave informed consent for scientific publication. Committee on Standards and Practice Parameters, Apfelbaum JL, Connis RT, Nickinovich DG; American Society of Anesthesiologists Task Force on Preanesthesia Evaluation, Pasternak LR, et al. Practice advisory for preanesthesia evaluation: An updated report by the American Society of Anesthesiologists task force on preanesthesia evaluation. Anesthesiology 2012;116:522-38. O'Neill F, Carter E, Pink N, Smith I. Routine preoperative tests for elective surgery: Summary of updated NICE guidance. BMJ 2016;354:i3292. Masaoka A, Monden Y, Nakahara K, Tanioka T. Follow-up study of thymomas with special reference to their clinical stages. Cancer 1981;48:2485-92. Thomas CR, Wright CD, Loehrer PJ. Thymoma: State of the art. J Clin Oncol 1999;17:2280-9. Yagi K, Hirata T, Fukuse T, Yokomise H, Inui K, Ike O, et al. Surgical treatment for invasive thymoma, especially when the superior vena cava is invaded. Ann Thorac Surg 1996;61:521-4.